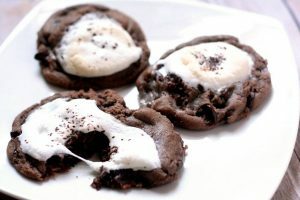 Hot Cocoa Cookies replicate the delightful feeling of a warm cup of cocoa on a cold day, with warm and gooey chocolate cookies topped with a toasted marshmallow. Hot cocoa is warm and comforting on a cold winter day. One of my favorite ways to relax in the cold months. There’s nothing really more soothing than wrapping yourself in a cuddly blanket and sipping on a big hot mug of hot cocoa. Until now! 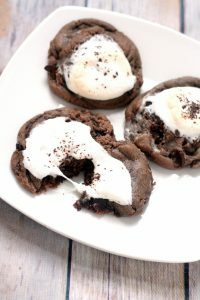 These Hot Cocoa Cookies replicate that delightful taste and feeling of a warm cup of hot cocoa on a chilly day. 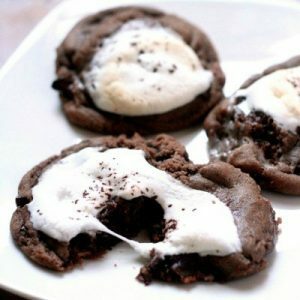 Warm, gooey, and rich chocolate cookies made with hot cocoa mix and filled and topped with toasted, gooey, and sticky marshmallows. Heaven on a baking sheet. Add eggs and vanilla and mix again. Combine flour, hot cocoa mix, baking soda, and baking powder and gradually mix into butter mixture. Stir until combined. Fold in chocolate chips and mini marshmallows. Chill dough for about one hour. 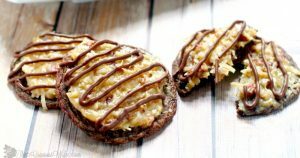 Drop rounded tablespoons of dough onto a greased cookie sheett, 2 inches apart. Bake in a 350° oven for 5 minutes. 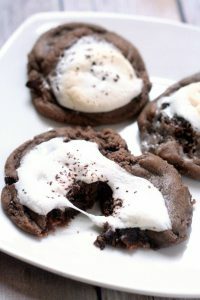 Remove cookies and press half of a large marshmallow onto each cookie. Continue baking for another 4-6 minutes, until edges are set. Allow to cool for 5 minutes before removing from cookie sheet onto cooling rack. For more amazing Christmas Cookies Recipes, check out the rest our Week of Christmas Cookies main page. 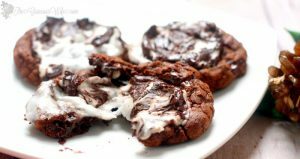 Did you like this Hot Cocoa Cookies Recipe? Find more on my Desserts and Christmas Cookies board on Pinterest! These sound amazing! Thank you for linking up to Party Time and we hope to see you again next week! 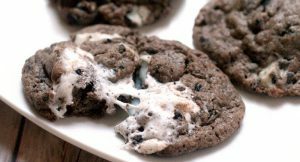 I love marshmallow and chocolate, so these cookies are a win-win and they looks so gooey and delicious! Stopping by from The PIn Junkie. Pinned! Merry Christmas to you!